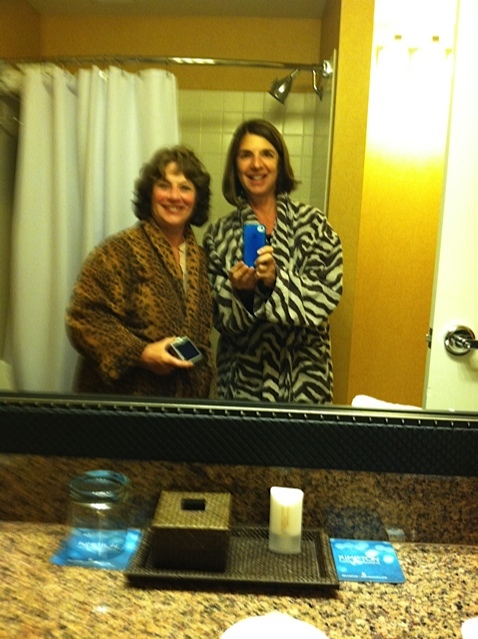 "Smart" Phone Photo Op with Eileen in our animal bathrobes! Let me begin by saying that this is a remarkable story, a true story about a surreal experience I had at the end of March. My friend Eileen and I planned an overnight trip to Portland, Oregon…just a quick getaway to eat, shop and sight-see. Portland is a three-hour drive from Seattle and it had been years since my last visit. For the record, I lived there for a year between1974 and 1975; it has, of course, changed and grown since that time and is now a fun, vibrant city. I investigated, copied parts of a New York Times article about Portland and booked a room at the Hotel Vintage Plaza – a lovely, midsize hotel close to downtown, the Pearl district and great restaurants. Lia, the guest services representative of the hotel, was most helpful in suggesting things and places we might enjoy prior to and during our visit. Let me be clear that I often discover places on my own that are not written up in newspapers or magazines – places that are fantastic for food or shopping. This ended up being the case in Portland. Through talks with shop owners, we were introduced to 23rd Street (LOVED) and we found a number of enchanting stores right around our hotel, such as the Portland Mercantile and several small boutiques. Neither place was ever mentioned in our research. We did read about the Pearl District and spent hours traipsing from clothing and home decor stores to art galleries. Frankly, we didn’t really love any of the stores we perused as we found them too contrived and young for a couple of 60-somethings. However, Lia suggested we try the food carts which literally line an entire square block and learned that these “food cart colonies” are clustered all around town. What a concept – like a mobile food court! I sampled falafel and Eileen chose Mexican food, which we took to the park nearby. For dinner, we made reservations at Andina, a Peruvian restaurant close by our hotel that my friend Kathy loved. Considering that Kathy is a foodie in every sense of the word, I always trust her restaurant recommendations. Again, the restaurants suggested in newspapers didn’t strike my fancy as much as great Peruvian ethnic food! We took a short taxi ride to Andina and spent two hours sampling six various Peruvian tapas. 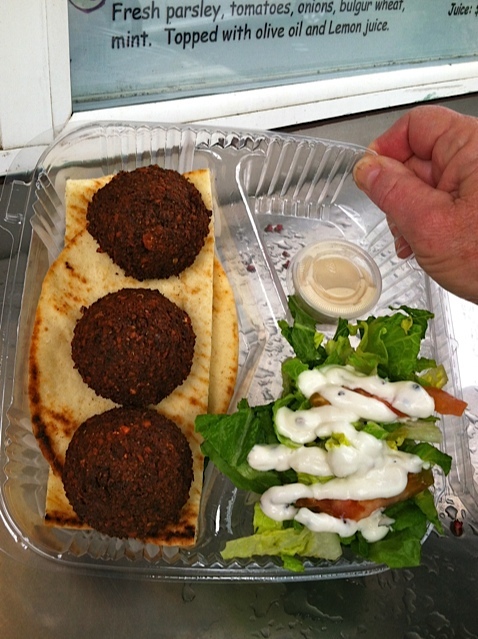 The menu was peppered with several quinoa dishes, breads, salads, and desserts. I was happy to discover a number of dishes featuring passion fruit including a delicious salad called Ensalada Verde Peruana – greens topped with hearts of palm, cotija cheese and asparagus drizzled with a passion fruit salad dressing that was so good I asked about how to prepare it. Our server informed me that the chef used about 20 various ingredients for this dressing! (No, I did not get the recipe.) 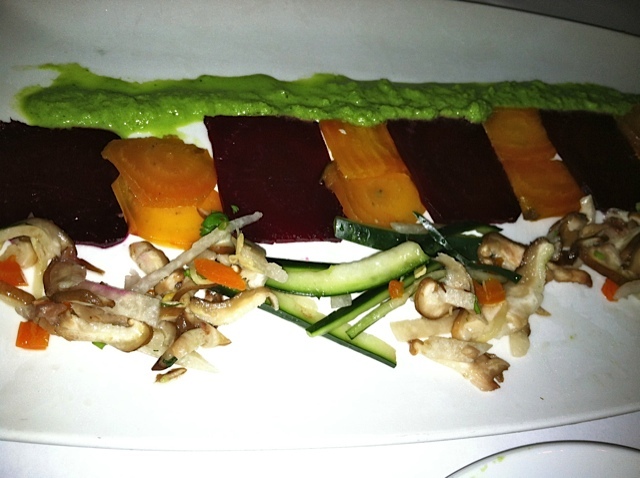 My favorite tapas was composed of thinly sliced red and golden beets flanked on one side with a ribbon of tasty, green vegetable puree and on the other with shaved, sesame scented, pickled vegetables. By the end of the meal we were tired and gave up plans to listen to jazz, returning to our hotel by taxi. The following morning we decided to wander around downtown, but Eileen could not find her cell phone. I called from my “smart” phone to her antiquated flip phone, surmising that if it rang we would find it buried among our belongings. No dice. We even got in the car and I again called her number. No ring. Eileen wasn’t that worried because she uses this $40 phone only for emergency contact and rarely makes calls and certainly has no important data stored. However, if it were truly lost, she would have needed to call her carrier, cancel the number, buy a new phone…you know the drill. No fun. Both of us are incredibly careful about organization and do not misplace our belongings, so the missing phone started to drive me crazy. Lo and behold, a few minutes passed when my phone rang and Eileen’s number popped up. “You’re calling me!” I chirped, then realized her CELL PHONE was calling my cell phone. A taxi driver, in very broken English, told me he found a cell phone in his taxi. It took several tries and I finally understood the address where he told us he’d wait for us to retrieve the phone. Little did we know that his location was 30 plus minutes from downtown – over bridges, down boulevards, and into the bowels of the Portland suburbs. Along the way I fantasized that this man would become Eileen’s future husband – the man of her dreams. My trusty but annoying portable GPS (who I nickname “The Lady”) gave us directions and miraculously we found the location and the taxi driver, wearing red pants as he described. He was young, toothless, and very sweet. Eileen was so grateful – she hugged the taxi man and told him what a kind, wonderful person he was. The whole ordeal exhausted us and we could not believe what had happened. It took us at least fifteen minutes to realize that this man in the red pants had been our taxi driver who transported us the previous night to Andina! Anyway, you’re probably wondering what all of this has to do with cooking and I must admit – absolutely nothing. However the Peruvian salad I enjoyed reminded me that asparagus is in season in the Pacific Northwest, so I thought I’d share one of my favorite, easy salads that I make this time of year: marinated asparagus. Back in my catering days, I used to serve this with salmon and noodle kugel. You’ll find this lovely tender vegetable in the spring, and the marinade has so few ingredients but brings asparagus to life. 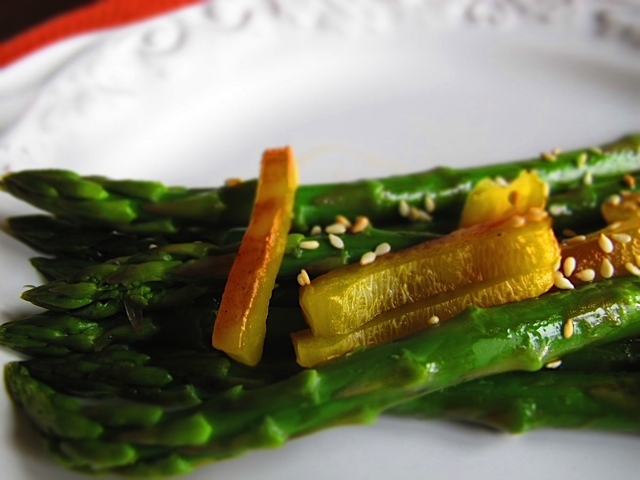 The asparagus and dressing can be made separately a day or two ahead of serving, so this is my spring “go to” dish when I attend a potluck or have company for dinner. Snap off the ends opposite the tips of the asparagus. Unless the stalks are pencil thin*, I peel the stems with a veggie peeler (if thin, you can omit peeling), put in large deep sauté pan with an inch of water. (My sauté pan is 11 inches in diameter.) Bring to a boil, and lower to medium heat for 5-7 minutes until the asparagus is bright green and barely tender when pierced with a fork. Leave the top off the fry pan when doing this. Remove the stalks of asparagus and put into ice water and let sit for 5 minutes. This stops the cooking and quickly cools the vegetables. Place the stalks onto a dry dishtowel, making sure the water is absorbed, and then put in a sealed bag or container. Mix the rest of the ingredients into a small jar and taste for sweetness. I often make a double batch of the dressing which keeps for a couple of months refrigerated. When using it for this recipe, it takes very, very little dressing. Roll the asparagus in the dressing right before serving or the dressing will make the asparagus turn a much less vibrant color. To serve, place on a serving platter and top with toasted sesame seeds. I usually garnish this with slivers of roasted red and yellow pepper. This entry was posted in North America, Vegetables and tagged 23rd Street, Andina, Asparagus, Hotel Vintage Plaza, Pearl District, Portland, Portland Mercantile. Bookmark the permalink. I loved the story – and the recipe looks terrific. I’m now paging backwards and forwards in your recipes – everything looks great, Muffy. I’m getting inspired! Thanks, Sandy. Most things are super easy and good to boot. I have to get the search function fixed but there are some gems there!